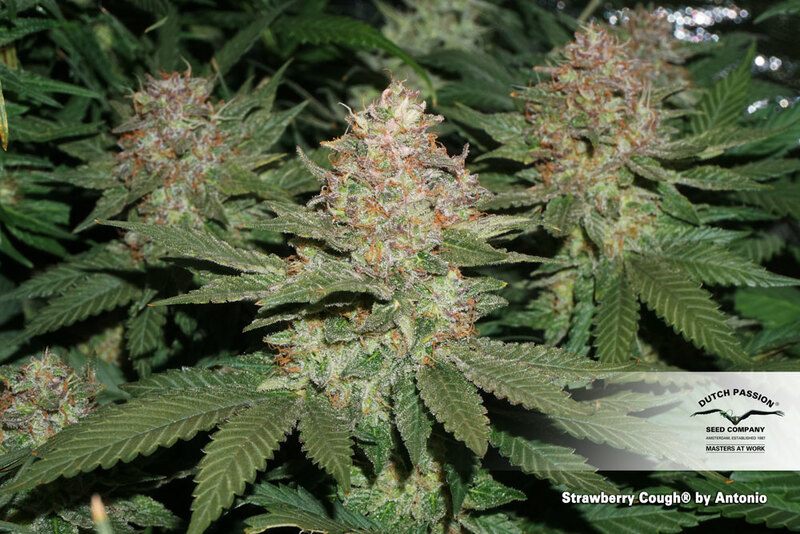 The “Strawberry Cough” genetics are of North American origin and partly uniquely European. 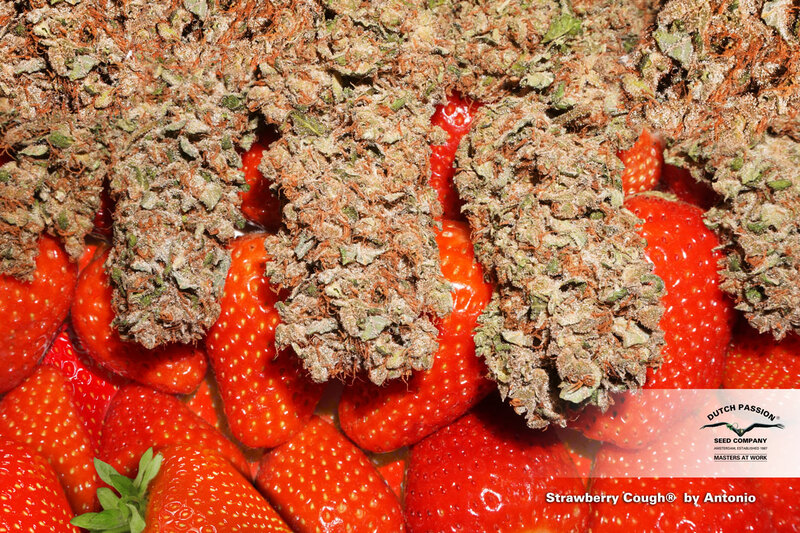 “Strawberry Cough” is a hybrid between an Indica and a Sativa. From this hybrid we made a selection having about 80% Sativa influences. 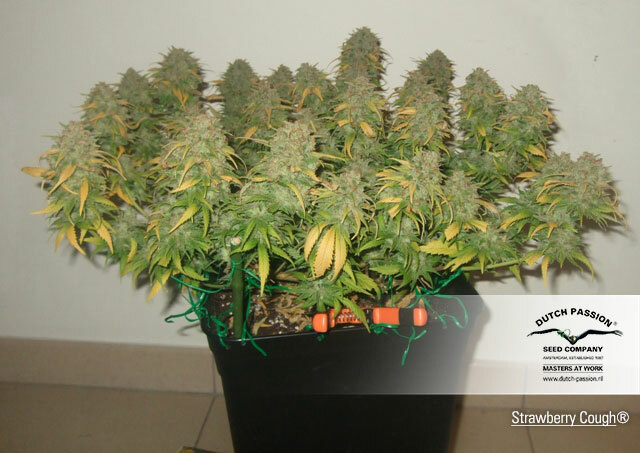 We have used this selection for the production of our “Strawberry Cough” Seeds. Our “Production and Research Team” has succeeded in creating the fruitiest variety imaginable. The fresh strawberry taste and aroma are very evident and wonderful to experience. 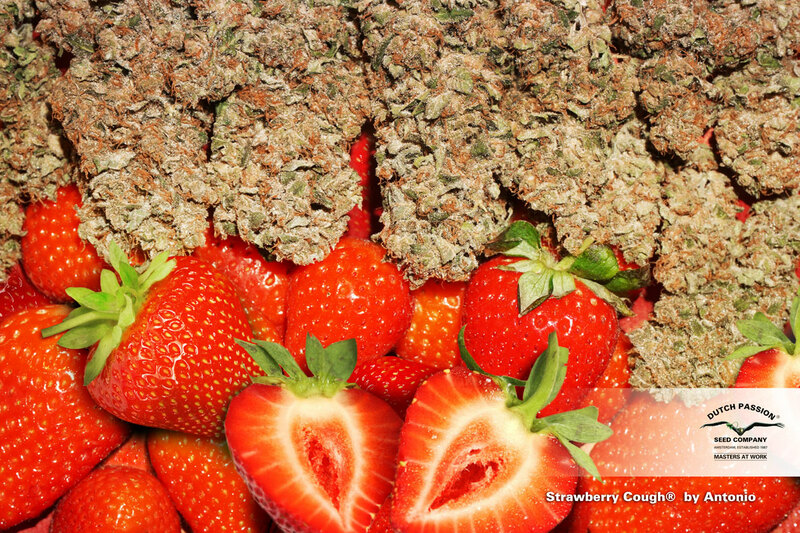 Strawberry has an “up high” effect of medium THC-strength. The plants are beautiful to look at. The total flowering time takes about 9 weeks. The first and most powerful growth spurt of flowers ends in week four, the second at week 9. 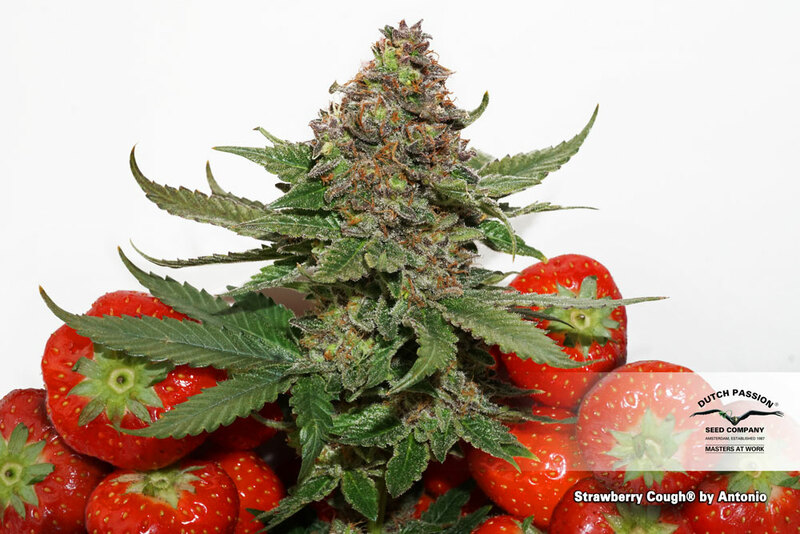 “Strawberry Cough” is easy to grow and does not need a strong fertilizing scheme. Standard fertilizing will do for good results. Individual plants will grow to medium height. Are you ready for the “Strawberry Experience”? Just bough some. What I understand if that Kyle Kushman gave seeds to Dutch-passion, he offered DP clones but DP asked for seeds. Kushman not having seeds crossed the his plant with something and sent seeds to DP. I been looking for the original strawberry cough but settled for DP’s Strawberry cough, hopefully it lives to the expectation. Janne Tranberg - Kyle Kushman created the original strain, but it was clone only. I know that in the netherlands they created a seed form that was similar. I guess this is what that is. So this won't be the original strawberry cough, no, but it's a similar form recreated in the netherlands. I am just wondering one thing. 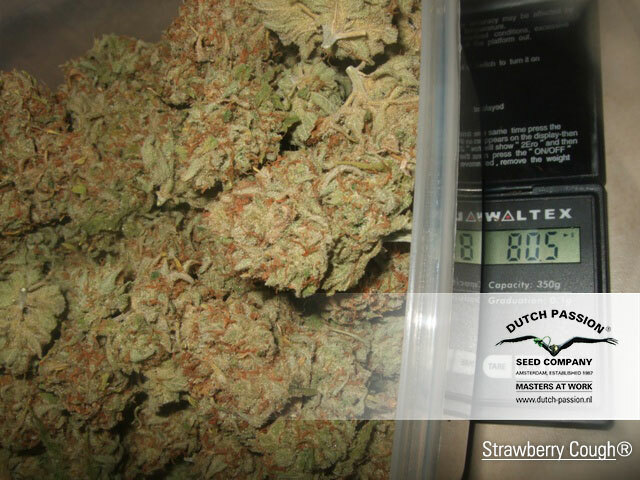 Which on is the original strawberry cough, kyle kushman´s or dutch passion´s?? it dont really matter bcose i am an long time customer of DP and next batch will be strawberry cough from DP, but i want to know, which is the original?? This plant is tops for people who are under severe stress of an emotional nature: Sour love affairs, devoice, depression, nervous ticks, PTSD etc., anything of an emotional or spiritual nature. The effects of this herb are exceptionally useful for any of these maladies. It’s very emotionally and spiritually calming. Somehow it blocks the effects of the Past. It will Not let your mind drift into the Past. I know it sounds crazy but Try It! Try this plant and see for yourself; don’t take my word for it! If you smoke this plant its effects will not let you visualize past events nor think of them. 99% in the now and .001% or less in the Future and NO Past + euphoria AAA+, maybe, by just blocking the Past you become euphoric? This is a very unusual Plant and there is no Past in its euphoria. This plant is worthy of scientific inquiry do to its unusual mental and spiritual effects and has great value in psychiatric medicine. Topped at the 4th node, fimmed 4 times prior to flowering on the multiple sites that subsequently formed. The plant absolutely BLEW UP over the course of the first week of 12/12. Had to rip her early for security reasons, but she was tracking to develop 6 beefy main colas by day 45, and even with just the faintest whisps of pre-flowers, the plant stunk up my whole grow room through a Can33 Filter. Vigorous, branched, hearty green growth all around! this was a quality smoke, happy and relaxing. I always looked forward to smoking this one and I will have to grow it again. It wasn't the best yielding plant I ever grew but fair play to Dutch Passion as they said it was an average yielder. Nice smooth old school stone.